In the above passage, God’s Word calls sectarianism a sin. Sedition is listed as one of the works of the flesh. Anytime we call ourselves Baptist, Lutheran, Messianic, Methodist, Pentecostal, and so on, we are committing the sin of sedition (i.e. sectarianism). Sectarianism leads to bigotry, discrimination, or even hatred among fellow Christians by attaching non-existent importance to differences between other members of the church of Jesus Christ – such as church denominations or factions. Sectarianism is not only a sin, it is also a sign of immaturity. Until we all reach unity in the faith and in the knowledge of the Son of God we are still not mature (Ephesians 4:13-14). The ideological underpinnings of sectarian attitudes and behaviors today are extraordinarily varied. Oftentimes, members of a particular religious group believe that their theological or denominational emphasis is superior to others, or even necessary for salvation. Therefore, they will aggressively seek converts from other Christian groups in order to persuade them to believe as they do. Strife exists continually between churches. Also, theological wars will be declared against adherents of opposing factions because they believe that their opponents are dangerous and heretical, and must be purged from the church. History proves that even torture and murder have been committed in the name Christ. In the not-too-distant past, the Roman Catholic Church actually burned people alive for believing them to being “heretics,” (i.e. holding opinions different than what the Catholic church believed to be the truth). Should the various members of the Body of Christ be divided and operate independently of one another? Not if we’re preaching the same Jesus and the same gospel message. For instance, in a real human body, what would happen if one foot said to the other, “I’m going in one direction while you go in another.” Or, the lungs would say to the heart, “I’m going to keep on breathing without your help.” What a mess that would be! Well, that’s what internal division has done to the Body of Christ among Protestants since the Reformation period. According to the latest statistics, there are over 200 Protestant denominations in the world today. Just about every town has a variety of Protestant churches dotting the landscaping. One church is for white Christians, another is for blacks, another is for those who believe in baptismal sprinkling, another for complete dunking. Some churches believe the King James Bible is the only true Bible to use, while others teach that any translation is the Word of God, and so on. Is all this division over race, petty arguments, or trivial theological matters really necessary? Of course not. Why can’t we agree to disagree on the minor points and concentrate on promoting the major points of sound Christian doctrine? Why can’t we simply call ourselves “Christians” or “Followers of Jesus Christ” and stop labeling ourselves according to denominational lines? Wouldn’t we be wiser to pool our evangelistic efforts and financial resources and just have one church for the entire city or town to worship in? If all fundamental Christian churches would learn to work together in unity. just think of how much confusion and duplicated efforts we could eliminate, and how much more effective we could be in spreading the gospel of Jesus Christ and furthering the kingdom of God? SUBSCRIBE to our free online messages and receive notifications of our new posts by email. Categories: GRACE FOR TODAY, Sectarianism in the Church | Tags: Denominationalism, Factions, Galatians 5:19-21, Ideology, Michael Servetus, Religious Divisions, Sectarianism, Sedition | Permalink. Do you love God? I’m sure you do. Do you love your church pastor? Ah, maybe you have to think about that question some more. You see, too many Christians do not fully recognize that their local church pastor or elder is God’s representative and spiritual authority over your life. They have been given the responsibility to look after you…to teach you and disciple you and protect you from straying away from God’s flock or making mistakes that will hurt your relationship with Jesus Christ. Your local church pastor is your overseer (1 Peter 5:12). His is the ruling shepherd in the church and is accountable to God for you under the “Chief Shepherd” Jesus Christ. Their job is to feed you the Word of God, guide you in your spiritual walk, and guard over your souls. The Greek word used here for “chastening” is paideia. It not only carries the nuances of “discipline,” “rebuke,” and “correction,” but also the positive connotation of “training” and “guiding instruction” by a loving parent to bring their son or daughter to mature adulthood. When a pastor chastens us for something that needs to be corrected in our lives, we should do the right and wise thing and accept his correction with humility. We should recognize that He loves us and desires to see us achieve our fullest potential in Christ. “Reprove not a fool, lest he hate you.” The fool, on the other hand, does not respond well to reproof or discipline. He faints when being rebuked and becomes angry and resentful towards his pastor or God. The fool is destined to never learn from his mistakes or reach any spiritual maturity. Some are so prideful they will actually leave the church when reproved and fall away from God. The wise Christian doesn’t get their feelings hurt when reproved by their pastor because he regards the Lord’s discipline as evidence of his pastor’s love and concern. He sees God’s grace and commitment to us as our Father in his actions. When we receive correction from those in church authority – such as a pastor or elder, instead of getting mad, let us remember the admonition of Jesus who declared that whom He loves, He rebukes. Instead of sulking in self-pity, let us repent quickly and learn to love reproof. Categories: GRACE FOR TODAY | Tags: 11; Revelation 3:19, Accountability, care, Chasten, Chief Shepherd, Christian., Christianity, Concern, discipline, Elders, Feeding, Flock of God, Fool, God, Guiding, Holy Spirit, Jesus Christ, Lord, Love, Messiah, Overseers, Pastors, Proverbs 9:8; 1 Peter 5:1-4; Hebrews 12:6, Rebuke., Religion, Reprove, Responsibility, Savior, Sin, Souls, spiritual authority, Teaching, theology, Wise, Word of God | Permalink. In the beginning God created the heavens and our planet earth. He is still creating other planets, suns and galaxies in the universe today. What a creative and awesome God we worship! Isn’t it amazing to know that one day, in our new glorified bodies which will transcend all space and time, we will be able to spend eternity co-managing the universe with Him? Do you love God? If so, He has prepared a wonderful and eternal future for you – the kind you could never imagine. PHOTO: Newly formed galaxy lights up its surrounding cosmic clouds. Its name is HD 97300 and it’s one of the youngest — but also the most massive and brightest—stars in the Chamaeleon Complex, 500 light-years away. Photo released on Feb. 10 by the European Southern Observatory and captured by the agency’s La Silla Observatory in Chile. Categories: GRACE FOR TODAY | Tags: Eternity, GodsCreation, GodsPromisesForMe, InfiniteSpace, MyFuture, Rapture | Permalink. Beautiful photo of double rainbow over Ravello, Italy. The rainbow is God’s reminder to us of his covenant not to destroy the earth with water, ever again. What a faithful heavenly Father is our God. He is worthy of our trust! Photo courtesy of National Geographic. Categories: GRACE FOR TODAY | Tags: Covenant Keeper, Faithfulness, God's Love, Worthy of Our Trust | Permalink. In the parable (allegory) of the vine tree, Jesus compares Himself to the “True Vine” because when we come to salvation, we are spiritually born again and given a special position as a branch on the Tree of life, which is Jesus the Messiah. He alone is the only Savior that can give us eternal life; all others are false prophets and false religions. 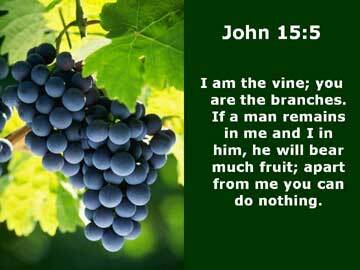 God the Father, on the other hand, is the “husbandman” (the farmer) that cultivates us as branches on the vine and tends to our care. He waters us every day, prunes our twigs, trims our leaves, and makes sure we are receiving the right amount of sunshine and nutrients from the ground. But Jesus reminds us that unless we continue to abide in Him, we cannot bear good fruit or flourish as one of His branches, since a branch cannot bear fruit of itself unless we abide in the source of nourishment – the tree. Studying the Word of God daily, keeping it continually in our hearts and minds, and letting it guide our lives. Maintaining the habit of prayer and communion with the Holy Spirit in order to draw new and fresh strength from Him. Obeying God’s commandments and endeavoring to live pleasing to Him. Attending church regularly and loving the fellowship of the brethren. Witnessing for Jesus everywhere we go and helping to bring lost souls to salvation. We will continue to abide in Christ if we follow the above guidelines. As we do, we will also continue to bear the kind of good fruit He desires from us as His disciples and remain eternally secure in our salvation. Order your free devotional booklet “Grace For Today” by Pastor Luis Yosefus which contains many more inspirational messages written to encourage your life and enhance your understanding of God’s Word. Simply email us your postal address and we will mail it to you free of charge at no obligation. Categories: GRACE FOR TODAY | Tags: Abide in Me, Attend Church, Bear Fruit, Branches, Bring the Lost to Salvation, Communion, Eternal Life, Eternal Security, Faith, Farmer, God, Holy Spirit, Husbandman, Jesus Christ, Jesus the Messiah., John 15:4-5, Life of Christ, Love the Brethren, Messiah, Obet God’s Commandments, PRAYER, Pruning, Religion, Salvation, Study, The True Vine, theology, Tree of Life, vine tree, Witness for Jesus, Word of God | Permalink. Phubbing (or phone snubbing) is a modern-day problem affecting many people today. Perhaps you may be guilty of phubbing others, and never realized it. I feel that I am being ignored when my friend or partner gives more importance to his/her cell phone than to paying attention to me. The new cell phone technology has provided many benefits for users, but it has also created social problems too. 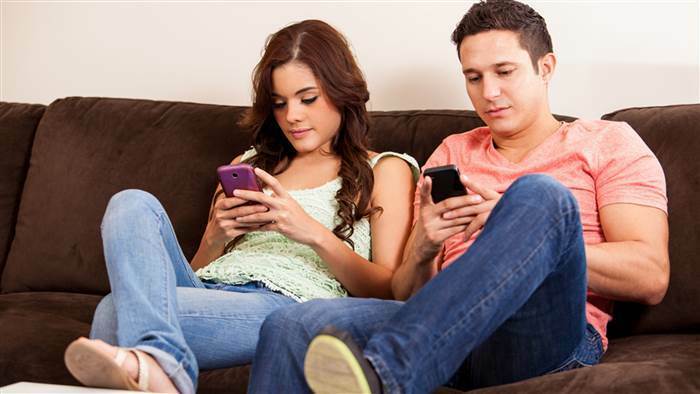 New studies on human behavior show that it is having detrimental effects on our relationships, and is monopolizing our attention spans. Respondents to a recent survey said that being “phubbed” by their friends or partners inevitably causes conflicts, lowers the level of our relational satisfaction, and leads to higher levels of depression from being neglected. I can imagine how Jesus feels when we ignore Him. Whether we are too busy or distracted to pray, study His word, or spend quality time with Him, our relationship with Jesus suffers too. We start losing our peace and joy, and experience decreasing satisfaction with our Christian faith. When this occurs in our lives, we’ve got to take drastic steps to remedy the problem. Since Jesus requires being the number one priority in our lives, we may have to ditch whatever has come between Jesus and us. Our Master and King must reign in first place in our hearts and lives – or He is not truly Lord at all. Think about it: Have you been “phubbing” Jesus by neglecting His fellowship, personal prayer time, missing church services, or allowing other priorities in your life to come between your relationship with Him? If so, it’s time you stopped ignoring Jesus and make things right. Categories: GRACE FOR TODAY, TRENDING | Tags: Cell Phone Distraction, God, Jesus is Lord, Number 1 Priority, Phubbing Trend, Relational Conflicts, Why Call Me Lord | Permalink.